With jobs in the solar and wind power industry expected to double in the next 10 years, according to the U.S. Bureau of Labor Statistics, UCF’s Florida Solar Energy Center (FSEC) is primed to produce workers who have the cutting-edge skills to fill those positions. 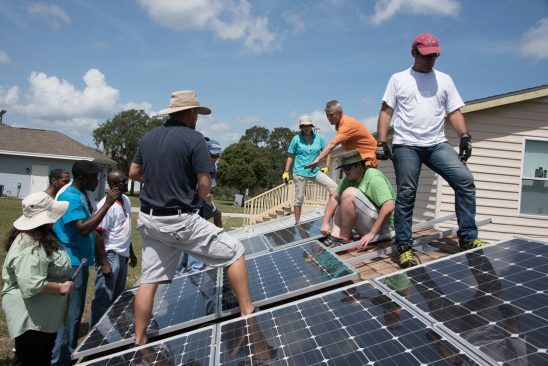 The center has already trained more than 20,000 people in Florida to install solar energy systems and to improve the energy efficiency of Florida’s buildings along with a host of other energy efficient technologies. Over the years those programs have evolved to include energy-efficiency, sustainability and building science. The primary audiences for these programs are skilled trades, energy professionals and educators. FSEC’s faculty research can also be felt by taxpayers and homeowners alike. For example, FSEC’s buildings research has helped save state residents more than $2.5 billion in energy costs since 1975. Solar research has led to more than 300,000 solar energy systems installed in the state – saving homeowners $40 million annually. FSEC’s outreach to classroom teachers is also helping inspire the next generation of energy scientists and engineers. And the most direct impact – people are getting jobs. David Bessette, president of Energy Technology Services in Orlando, has 30 employees who were trained in solar installation through FSEC programs. “It is my belief that the training at FSEC has well prepared the people that I eventually hired as they came out with a much better understanding of what is required of entry-level installers,” Bessette said. A CBS News MoneyWatch report recently highlighted the growth in alternative energy industry jobs. The news report cited the Solar Foundation’s National Solar Jobs Census of 2016, which showed Florida as one of the top five states in the country where solar jobs are growing the fastest. The Solar Foundation operates the Solar Training Network (STN), a US Department of Energy funded program that helps meet the workforce needs of the solar industry through solar training and strategic employment partnerships. FSEC is a subcontractor to the Solar Foundation as well as a training provider member of the Network. FSEC’s training catalog includes courses on Photovoltaic System Design and Installation, Weatherization, Home Energy Rating, Residential Building Leakage, Energy Code Compliance, Green Building Certification, and Teacher In-Service Training. In addition, several courses are available online. Many of these courses offer industry recognized credentials and certifications. FSEC partners with local workforce boards to assist job seekers in obtaining needed skills for new or upgraded employment opportunities. FSEC in partnership with the national labs and industry leads research programs in energy and transportation: energy efficient homes, photovoltaic (PV) manufacturing, PV testing in hot, humid conditions, programs to decease the soft-costs of PV installation, energy storage, alternative fuels and electric vehicle transportation. “It is this collaborative research that allows FSEC to anticipate future energy needs, solve real problems and keeps our training programs on the cutting edge,” Fenton said.